Dark columns of smoke billowing into the air, sirens endlessly filling the City of Leduc’s morning, a chopper hovering in the South-East corner of town. A plane is burning. It is rumored that it was forced to execute an emergency crash landing short of the International Airport runway that it was expected to land on. The flames and smoke from jet fuel burning paint a pink hue into the 9 am cloudless sky. Firetrucks are heard rushing to the scene and police cruisers race by with lights and sirens, ambulances close behind. On scene there are dozens of emergency personnel rushing to extinguish the fire, Public Services personnel placing barricades to redirect traffic, while emergency chiefs and City officials huddle in tense consultations in the EOC (the Emergency Operations Centre), a large trailer parked several meters away from the incredible heat of the raging inferno. On the morning of Wednesday, June the 8th, in the Leduc Recreation Centre’s east parking lot, this scene of tragedy and controlled chaos was not a nightmare, and not quite a reality. In fact, it was a ‘rehearsed incident’. It was an Aircraft Simulation Exercise, an Emergency Preparedness exercise planned (for many months!) 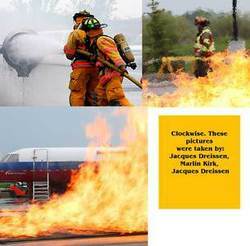 and executed by the City of Leduc, with the cooperation of the Edmonton International Airport, which owns the priceless piece of equipment that was used for this emergency exercise. Every couple of years, the City of Leduc spends hundreds of hours planning the re-creation of an ‘unlikely’ but serious incident that could happen in this City. In the past few years, the City of Leduc has prepared for a hostage-taking situation, a train-school bus collision with multiple victims, and this time the emergency was a crash landing of a commercial aircraft. This simulated emergency in the City of Leduc was the first time a Mobile Aircraft Fire Trainer (MAFT) was used in a Canadian city. The Airbus A330 is the aircraft simulator on loan from the EIA, and came equipped with a Control Booth, a square and sturdy trailer that controls flames shooting out of the plane’s body. As the flames were extinguished rather rapidly, there was a need to get the fire started again, to maximize the training opportunity the MAFT provided to our City’s firefighting crews. Leduc’s Director of Public Services, Rick Sereda, who has many years of experience in fire services, had a new role for this exercise. He was the Chief of Logistics, operating from the Leduc Fire Station. Anything that was needed such as more manpower, equipment, barricades, backhoes or extra Firetrucks, it was his responsibility to get it ‘procured’ to the team on site. This would include decisions regarding a request for assistance from neighbouring fire departments, to come and assist the Leduc Fire department. The Mutual Aid concept is valuable and often used for this simulation, the Millet Fire Department was on standby, and the Airport Fire Crew was the second in command to deal with this mock aircraft crash. Part of Mr. Sereda’s job that day was to direct the 50 or so Public Services staff to control the jet fuel leakage situation, and take the necessary measures to contain this dangerous leak, thus protecting the environment and nearby residences. This was also an occasion to test Leduc Fire Services’ Incident Command System (ICS), the new gold-standard for emergency response management. It was used to bring together all pertinent agencies while the City of Leduc took on the lead role of the emergency management. The City’s detailed media releases informed us that the “live-fire” exercise directly involved at least 100 emergency personnel, at least 20 student actors with mock injuries, and many partner organizations including: EIA, the RCMP, the Alberta Emergency Management Agency (AEMA), the Shock Trauma Air Rescue Society (STARS), the Transportation Safety Board of Canada and Leduc County“. One of the young ‘victims’ was Danielle Lemming, who was involved in the last Emergency preparedness exercise in Leduc two years ago. When her Leduc Comp Drama Class was asked to participate, she didn’t hesitate to submit her name once more, and is proud that she could contribute to her city’s welfare this way. Danielle and her classmates did very well ‘acting out’ the injuries described on Status cards hanging loosely around their neck, a triage procedure used by medical personnel. It had taken months to prepare, and on the Monday night previous to the Wednesday ‘doom day’, the MAFT was already in place, and a critical component of this training exercise, the Live Feed cameras, were strategically positioned to record the ‘incident’. Three cameras were in operation, two near the landing site and one in the building where the triage of (mock) victims was taking place. According to the City of Leduc’s IT Manager Gerald Unger, this was an extensive project involving several city departments. The Live Feed was offered via the Internet to any and all residents who wanted to follow the proceedings remotely. It will take a few weeks for the IT staff to prepare and submit some video clips to Leduc’s Council. Following this step, these will be available on the City’s website, www.leduc.ca. Mr. Unger worked from the EOC with Leduc Fire Chief Ernie Polsom, who directed and supervised the entire exercise. Some IT team members were monitoring the live feed, also ensuring that the video was broadcasted successfully to the large screens within the LRC. He shared that in his opinion, this was a perfectly executed training exercise, and the video recording will help further refine and share the training opportunity they created. DC Gerry Kelly (Deputy Fire Chief) has Emergency Preparedness in his Leduc Fire Services portfolio. He shares that although such an incident is uncommon, (a plane unable to reach the airstrip and having to do an emergency landing on a property nearby) should it occur, the population would be at risk. There may be hundreds of casualties, fuel leaking into the sewer system, so a city has to be fully prepared to deal with all aspects of an emergency. An interesting point made by DC Kelly is that in emergency management, nothing is written in stone. All agencies involved must be flexible, and the worst case scenario has to be the focal point of an emergency exercise. The last aircraft incident in the Region was in the early 70s, when a commercial airliner carrying a large number of cattle crashed, killing all onboard. With increased flights and another airstrip being added at the EIA, this training exercise was timely!